We think that renting a car in Hawaii is one of the most important things you can do to get the most out of your vacation. 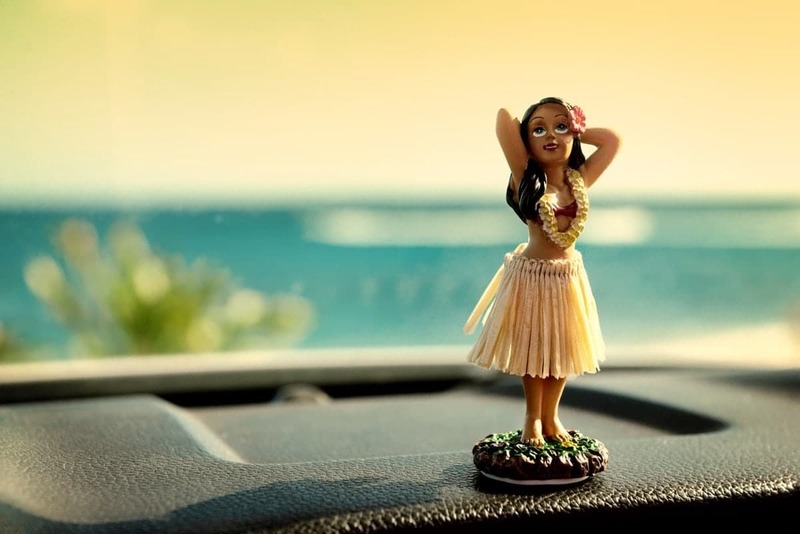 Over 80% of the visitors to the Big Island agree and rent a car during their stay. The best way to find a good deal on a Hawaiian car rental is to book early, preferably with a local rental agency. It is possible to make your way around the Big Island using public transport but it is both more time efficient and convenient to rent a car. Do you need a rental car during your whole stay? Most of the national car rental agencies have offices at any of the two international airports (ITO – Hilo and KOA – Kona) on the Big Island. If you have a clear favorite please go ahead and book with your rental agency of choice. Keep reading if you are willing to shop around to find the best possible deal on your rental car. The price of a rental car depends on many factors. The two most important things that influence price are  availability and  how soon you need a rental car. As for the time of booking the most important tip we can give you is the following: book early if you are going to be on the Big Island during popular events such as the Ironman triathlon (mid-October) or the Merrie Monarch Festival (mid-April). Christmas is also a notorious period if it comes to renting a car. These points are explained in more detail below. The best way to find a good deal on a Hawaiian car rental is to shop around at the local rental agencies. Besides, why not go local? Some rental agencies here on Hawaii have negotiated guaranteed discounts with the rental car companies, and they pass some of these discounts on to their costumers. You can get especially good rates if you are willing to be flexible about the exact details of the make and model of your car. One strategy to get a good deal on a rental car is to book early at the local rental agency mentioned above, and then to check back in at a later time to look for lower prices. About 6 weeks before your departure is a good time to try to find a better deal. For this strategy to work it is important to make your first reservation with an agency that allows cancellations without a penalty. For example, a mid-sized 8 days car rental might cost $450 the first time you book 4 months before you arrive at Hawaii. Typically, this price will start declining down to say $240 at 1 or 2 weeks before arrival. The last days before arrival, prices can suddenly jump up to ridiculous prices again. We have seen examples where a car that was at its lowest $240 suddenly jumped up the $900 in the last days before arrival. Using this method can thus save you a couple of hundred $$$ but does require that you invest extra time in booking and re-booking. It works best for people that like to plan ahead. This method can potentially give you the biggest savings but should be combined with making an early booking (that can be cancelled for free) in case nothing turns up. Priceline is a website connects customers and car rental agencies via an online bidding system. You can bid whatever you want on a rental car, and if the rental agency accepts, the deal is ‘locked’. The advantage of this system are the potentially very low prices. 30% to 40% discounts compared to ‘direct’ booking prices are not uncommon. The disadvantage is that you are paying upfront and that you can not cancel/change/extend your booking once your bid is accepted. A good rule of thumb is to aim for at least a 30% discount compared to the direct rate to justify this lack of flexibility. If you use priceline far in advance it is best to start your bidding low because ‘normal’ prices are expected to drop (except around the really busy periods, in which case you should book early), and once you make a deal using priceline it cannot be canceled. Prices generally drop once the rental date approaches, but it is possible you won’t find a good enough deal with this service. It is important to already have an early booking that can be cancelled for free so that you don’t find yourself without a car on Hawaii. Priceline works with many of the large car rental agencies such as Hertz, Budget, National, Avis and Alamo, and the quality of the cars you rent is equal to the ‘normal’ car rentals. Go to the priceline website to give this strategy a shot. If you are staying for more than 30 days and want to rent a car on the Big Island, have a look at e.g. island discount rentals (only in Hilo). This company rents out used cars and offers very competitive prices on longer term rentals. The offices of all these agencies are located on the side of the road opposite to the arrival and departure terminal. Harper’s and Enterprise are not represented at the airport, but offer a shuttle service. Especially Harper’s might be of interest for you if you are looking to rent a 4WD car that can take you to the Mauna Kea summit. There is no public bus service to or from Hilo airport. If you don’t have a rental car your transport from the airport would have to be either by taxi or personal pick up. Hilo International Airport (ITO) is located on the edge of Hilo, about 3 miles east of the downtown area. 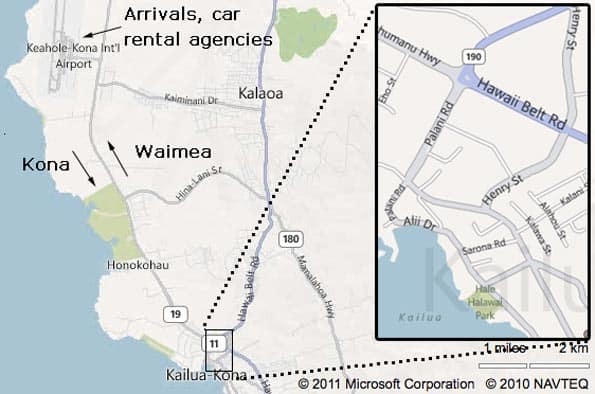 Renting a car in Kailua Kona is easiest directly at the airport. There are check-in counters for the rental agencies across the street from the baggage claim for all major car rental companies. You can find more offices of rental car agencies in the town of Kona at the King Kamehameha hotel and scattered through the resorts on the north Kona / Kohala coast. You can find more information on what rental car agencies can be found at different locations along the Kona coast (in Kona, at the airport, and at the resorts) below. All car rental companies maintain check-in counters off terminal and are served by shuttles. The shuttles stop at the center median located across the street from baggage claim areas A and B (last checked January 2019 at source). The rental car offices in Kona are all centered around the Kailua pier at Ali’i drive. This is to facilitate the cruise ship passengers that arrive in Kona at the Pier. Thrifty, Hertz and Dollar all have set up shop in the King Kamehamea Hotel (source), across the street from the pier. Enterprise has its office a bit further away, at a 20 minute (1 mile) walk from the pier ( at 74-5583 Luhia Street). At 27 miles from the airport (32 from Kona) there is an Enterprise office that services the Mauna Kea Beach Hotel. South of Kona, there is a Hertz office at the Sheraton Kona Resort & Spa at Keauhou Bay. “Drive with aloha” is the best advice we can give people when they ask if driving on Hawaii is different. Be considerate, drive slowly in residential neighborhoods and take your time. Wow, you made it all the way to the end of our guide. Thank you for your interest! Can I take a rental car to the Maunakea summit? Do I need to rent a car for my whole stay on the Big Island? When should I book my rental car extra early? Please drop us a line if you have another question about renting a car on the Big Island that is currently not answered on this page. 1: Can you take your rental car to Mauna Kea? Most rental agencies do not allow you to take your car onto the really rough roads of Hawaii. In the case of your Hawaiian vacation this is most relevant if you want to go stargazing on the Maunakea summit. Rental cars are allowed up the mountain as far as the Onizuka Center for International Astronomy (a.k.a. the visitor center). The road to the summit of Mauna Kea between the Onizuka Center for International Astronomy and the telescopes on the summit is off limits for most rental cars. If you want to drive up the mountain yourself (instead of joining a tour) you need a 4WD car. The only 4WD rental agency on the island that allows their car to be taken that far up is Harpers Car Rentals. Harpers operates from two locations: one in Hilo and one in Kona. Consider double booking a 4WD with them for a day in addition to your own rental car since this probably will be your cheapest option. Another place you should not visit using a rental car by the way is green sand beach. 2: Do you need a rental car for your whole stay on the Big Island? If you plan to spend a significant part of your stay at one location and don’t have big travel plans you might be best off renting a car for only a part of your vacation. Keep in mind though that, even if you stay at the resorts close to the beaches, having a car is still really handy to explore those beaches. If you only need a car a couple of days it would be best to rent a car close to where you are staying. Even if the deals on rentals cars at the non-airport locations available can be less good, it is often not worth the time and effort to find the lowest price if this means extra travel time to pick up and return the car. If you want to rent a car during your whole stay on the Big Island renting a car directly at the airport is your best option. You save the money and effort you’d otherwise spend on getting to your accommodation from the airport by shuttle, bus or taxi. Last time we checked there was no free airport shuttle from Kona airport to any hotel, so estimate to pay about $50 per person for shuttles to Kohala resorts, and $30 to $35 to Kona. 3: When should I book my rental car extra early? Because the Big Island is an island, there is a hard limit on the amount of cars that can be rented. During the especially busy periods it is normal that all these cars will be reserved making it impossible for you to rent a car if you start late looking. Don’t get stranded, plan ahead and book early! Call ahead or make an early reservation if you don’t want to be unpleasantly surprised upon arrival. We are part of the affiliate programs of discounthawaiicarrental.com and priceline. This means that we receive a small fee for every completed booking we send their way. This way you can help us cover the costs to host and maintain this website *while* you are booking your trip to paradise. Read more on our participation with affiliates here.